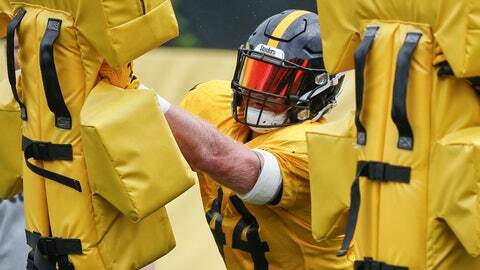 LATROBE, Pa. (AP) — Tyler Matakevich wants to prove he can handle the job. Jon Bostic just wants to be on the field. Matakevich and Bostic are competing for Pittsburgh’s opening at inside linebacker after the Steelers did not use a draft pick on the position. The winner gets to start alongside veteran Vince Williams and an opportunity to help fill the massive void left by Ryan Shazier, who is out for the season while recovering from spinal stabilization surgery. The Steelers signed Bostic to a two-year contract in March to provide veteran depth at inside linebacker after Shazier got hurt last December at Cincinnati. The Steelers gave Matakevich and Bostic a vote of confidence when they opted not to select an inside linebacker in April’s draft. Matakevich, a 2016 seventh-round pick, has played in 31 games with the Steelers. While he hasn’t made any starts on defense, his impact has been felt on special teams, particularly last season. Matakevich blocked two punts, including one that was recovered for a touchdown. He also broke up a pass on a fake punt by Minnesota. Matakevich took the majority of the first-team snaps during spring workouts, but he and Bostic have shared the starting role during training camp practices. The well-traveled Bostic is currently on his fifth team, having also played with Chicago, New England, Detroit and Indianapolis. He said it doesn’t matter where he practices, as long as he’s on the field. Bostic spent 2017 in Indianapolis, finishing with 97 tackles, a sack and a fumble recovery in 14 games before a knee injury ended his season. Matakevich battled a shoulder injury last season, initially getting hurt against Kansas City in October. He left a December game against Cincinnati and was inactive the next week against Baltimore before finishing out the season and undergoing shoulder surgery following the Steelers’ playoff loss to Jacksonville. Now, there isn’t anything holding Matakevich back. The same goes for Bostic. NOTES: Tomlin said OLB Bud Dupree has a concussion. … WR Antonio Brown missed his fourth practice and is considered day to day. … CB Joe Haden, CB Brian Allen, OL Chukwuma Okorafor, OLB T.J. Watt, TE Vance McDonald and CB Coty Sensabaugh all missed Saturday’s practice. … WR Darrius Heyward-Bey and WR JuJu Smith-Schuster couldn’t finish the workout.